“Crimson Peak” is visually overwhelming and ingeniously devised. Although it was a bit of a disappointment for me, it made a crushing, lasting impression on me on the other hand. Not because of the story itself or the cautious use of special effects, but the overall atmosphere and detailed decoration of this gothic love drama. I assumed that this would be an excellent horror. And that because of the trailer. Normally I try to avoid trailers. But avoiding trailers in a theater is rather difficult. Eagerly I saw that it was about a house that comes to life. I was expecting a baroque-looking Amityville House. The house wasn’t disappointing. A Victorian, ghostly ruin full of dark corridors, murky caverns and sinister secrets. The Adams family would be jealous. But apart from some ghostly apparitions it was no more than a obscure drama in which a romance and a diabolical fraud scenario occurred. Del Toro succeeded in surprising me with “Splice” and especially “Mama“. After his intermezzo with “Pacific Rim“, he returns to the darker and creepier genre. “Mama” was more frightening as a paranormal horror story than this movie. There are some great horror moments that will give you the chills. The scarce ghostly presences look pretty decent and occasionally it made me think of how the creature in “Mama” was moving around. But the darkness in this movie, is mainly achieved by the overall Gothic decorations. Both the sets and the costumes contributed to that. A house like a morgue. Deathlike, chilly with those blacks shades and rotting walls full of secrets, while standing on a blood-red surface. The characters of this Victorian era also look eerily deathlike. An appearance as if an undertaker took care of their makeup. Mia Wasikowska plays Edith Cushing, the fragile daughter of a wealthy entrepreneur who wants to become a writer. Her literary work deals with ghosts. Since her childhood, she has the ability to see ghosts. 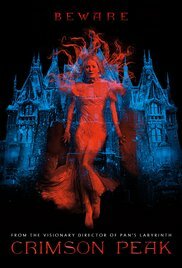 Her mother, who died of cholera, visited her when she was only 10 years old and warned her for a place called “Crimson Peak”. This particular moment is subtly visualized. A chilling moment that contrasts with the other appearances. And then she meets the likeable, sophisticated English landowner Thomas Sharpe (Tom Hiddleston) when he knocks at her father’s door with the demand to help financing a modern clay machine. What follows is the predictable romantic development, a sudden tragedy and Edith deliberately seeking solace in the arms of Thomas. And before she knows it she’s on her way to England to move into “Allerdale Hall,” the family patrimony which is sinking into the red clay, along with her husband Thomas and his sinister sister Lucille (Jessica Chastain). “Crimson Peak” has its pros and cons. First there’s the atmospheric cinematography. There’s a huge Edgar Allan Poe feeling about it. Furthermore there are the beautiful costumes and the detailed decorations. And finally the solid acting and performances. Hiddleston, who reminded me of Coppola’s Dracula at a certain moment, and Wasikowska act impressively. But Chastain rises above everyone as the crazy sister. The whole resembles a ride in a haunted house at the fair. Through the pitch-black darkness interspersed with deep colors, where you expect heart crippling shock effects anytime. And just like this haunted house at the fancy fair, the conclusion afterwards is that it wasn’t so bad as expected. It wasn’t boring, but it wasn’t very scary either. The biggest mistake they made was having people believe “Crimson Peak” is a sort of horror. Ultimately, it’s just a sentimental costume drama with a paranormal aspect. But believe me, it’s masterfully portrayed!